I would recommend completing this activity in groups. 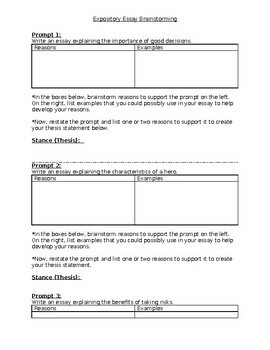 Students are provided with 4 expository prompts, and I gave them around 6-8 minutes to work with each prompt by brainstorming potential reasons and examples to support the prompt and ultimately creating a thesis statement for each one. I had students rotate to different tables for each new prompt just to get them moving, and I had the specific prompt written out and provided at each group of tables.